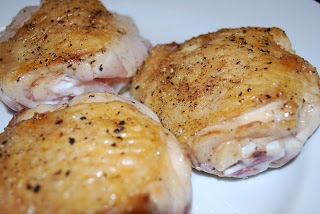 *Chicken (bone in, skin on chicken thighs are necessary in order to produce a moist dish...chicken breasts will simply dry out) is browned (skin will be brown and crispy, but the inside will still be rare) in bacon fat or EVOO and then removed from the pan. 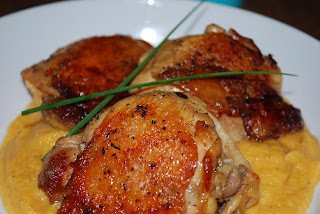 Use chicken breasts and omit the bacon, for a lighter version. Add the onions, garlic, carrots (and/or any other root veggies you'd like to add), and cauliflower to the crockpot or dutch over (I use a dutch oven). Cook the veggies over medium heat for about five minutes and then nestle the chicken back into the pot, between the veggies. Add chicken stock (Pacific Natural Organic Free Range Chicken Broth) and bring to a simmer. Cook for one hour, over medium heat. Before serving, remove the chicken from the pot and set aside. 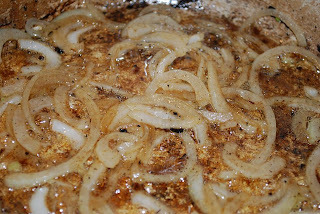 Heat 2 T. olive oil, in a separate saute pan, over medium-high heat. Once hot add the chicken thighs, skin-side down. Cook until the skin is crisp and brown, about 3-5 minutes (see above picture). While the chicken is browning, puree the veggies with a little of the cooking liquid to create a smooth, creamy consistency.